It occured to me that if you are new to alcohol pens you may wonder what all the fuss is about with our new Spectrum Noir pens and think that you can get the same effects from normal felt-tip pens. This couldn’t be further from the truth and you can achieve so many wonderful, professional looking results from using alcohol pens so I thought I would give you a bit of an introduction to these pens. In short, alcohol pens are different to water-based pens as you can blend colours so much easier and load colours on top of each other. When you try to blend or layer up water-based pens, the paper will get damaged and the paper fibres will break away. This isn’t the case with alcohol-based pens – the paper does not get damaged. Also, once the alcohol evaporates from the surface it becomes acid-free so you will be safe in the knowledge that you can use them for archival projects (although, like most colouring mediums, they will eventually fade with continual exposure to sunlight). Because the ink in alcohol pens is permanent, non-washable and quick-drying you can also use them on non-porous surfaces too, such as acetate, glossy card and shrink plastic. 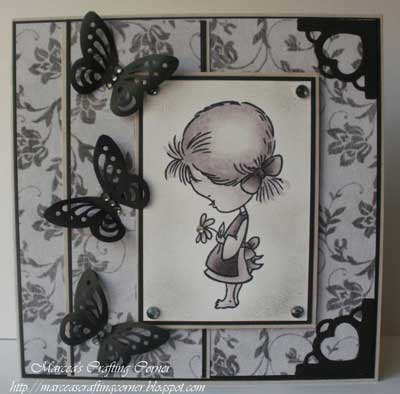 To colour in a stamped image I would recommend you use a dye-based inkpad to stamp your image and ensure it is completely dry before you begin colouring to ensure that the colours don’t bleed. When you begin colouring, start with your lightest colour then gradually add your darker colours for your depth and your shadows. You can go over the entire area with your lightest colour to blend the colours seamlessly together and it will not affect the nib at all. If you do find that a darker or different colour shows on your nib all you have to do is rub the nib on a scrap of paper until the colour vanishes.There is also a blender pen available to help achieve effortless results – it will look like you have painted the picture rather than used pens! Spectrum Noir pens are designed specifically for crafters which sets them aside from the other alcohol markers on the market at the moment. They are also fully re-fillable and have replacement nibs, so once you buy a Spectrum Noir pen you will never have to buy another one of the same colour ever again! The pens are dual tipped – they have a fine tip on one end (much finer than the bullet tip of Promarkers) and a broad chisel nib on the other end. The Spectrum Noir pens come in packs of 6 (with an RRP of just £6.99 for each pack) and each pack is colour themed which means you get 3 cool shades and 3 warm shades (light, medium and dark) in each set. It has been designed this way so that blending will be much more straightforward. This is great for those who sometimes struggle to get good shading and highlighting with other brands. You can also buy add-on packs in collections of lights, brights, pastels and darks. These packs are in sets of 24 colours that you get in these add-on packs will not be in any of the colour themed 6 packs. But be assured that there will be no duplication of colours in these packs, meaning that there are 168 colours available in total that can be mixed on the surface, or layered over each other for professional blending. In short, Spectrum Noir pens are a must-have for any serious crafter who likes their colouring – especially rubber stamping enthusiasts! I hope this has helped you out a bit if you were unsure about the Spectrum Noir pens and how they worked. To take advantage of the introductory offers we have on at the moment then hop across to the main Crafter’s Companion site to take a look. 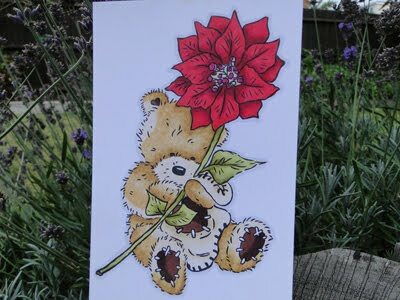 I’ve also got some more examples of colouring in using Spectrum Noir pens that have been put onto the I’m a Crafter’s Companion Facebook page. I’ve put a couple of the pictures throughout this post, but why not join the group for a constant source of inspiration, and of course to see all the amazing projects made?